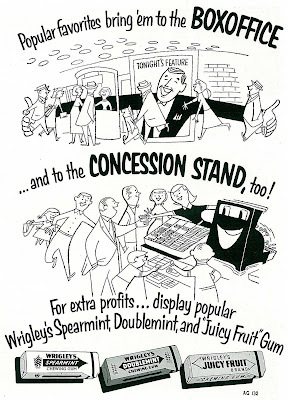 Nowhere was selling so intense as concession stands in the fifties. Those (popcorn) kettles had been boiling since the war ended. Soft drinks hoarded for service personnel were now available to everyone, as was candy and other sweet confections. 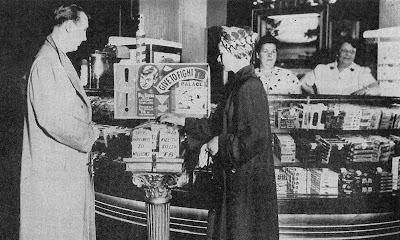 The end of sugar rationing opened gates wide for treat counter expansion and profit enough to make up some of the loss resulting from reduced attendance and higher film rentals. Never before were patrons so manipulated, for theatre admission was but a preamble to management's dedicated campaign to lighten customer purses. The sensory seduction began with popping corn in the lobby, its siren song irresistible to eyes, ears, and smell. One fix necessitated another, as salt-laden bags aroused customer demand for beverage. Small change was returned for dollars spent, thereby tempting further impulse purchase of snack goods. Candy became huge. Nestle would package chocolates especially for theatre sale, nickel bars good, dime ones better. 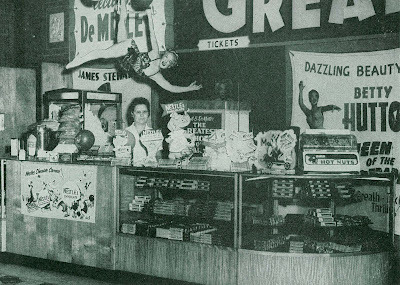 Dressing concession areas became as important as displays out front, and no longer was negotiation limited to food. When the Des Moines Theatre in that city went to selling The Greatest Show On Earth, it all but pulled viewers out of their seats to insure repeated visits to a lavishly appointed counter as shown here. A Betty Hutton trapeze cutout swung over the heads of attendants, and fairground-inspired displays filled the lobby. Clowns plus barkers worked streets approaching the theatre, circus bric-a-brac sold alongside candied treats. Your seat in the auditorium was no refuge from determined hawkers working aisles during intermission, and even seizing the stage itself. Ladies and gentlemen, while we are changing acts in the center ring, our ushers will pass among you with popcorn, peanuts, Crackerjack, hot dogs, and soft drinks. Further stating the obvious, and with the help of shrill whistles to command attention, barkers assured that These are for sale! They are real! They are delicious! 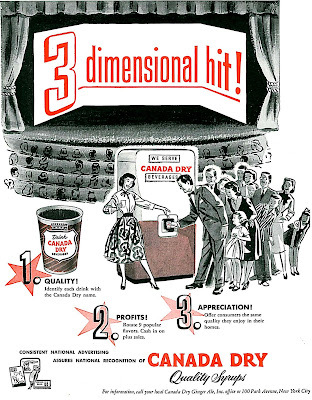 Throughout a newsreel opening the show, hard selling continued with employees marching back to front holding merchandise aloft and tossing bags and boxes to customers. Crowds for The Greatest Show On Earth necessitated several satellite candy counters throughout the lobby and mezzanine areas, with the Coca-Cola Company loaning extra coolers with aprons and caps for roving salesmen. It may seem like too hard a sell today, but carnival atmosphere was then an expected part of the moviegoing experience. Showing movies was but pretext to the lure of food stands. Air conditioning and plenty to eat were reasons enough to buy a ticket in those days. Double features meant you could settle in for hours enjoying cool comfort and take meals besides. Sandwiches might be offered in addition to sweets. We had them at the Liberty, plus a bulldog faced attendant named Frank who’d slam my M&M’s down with sufficient force to shatter the outer coatings. One thing we did not experience was a pitch for Will Rogers Hospital, the industry’s primary charity and one that functions to the present day. Again there were aggressive moves upon patrons to kick in. United Artists Theatres for one used to bring up house lights before ushers went among seated customers with collection cups. During the fifties, a fourth of operating venues maintained regular drives for the hospital, which was located in Saranac Lake, NY. Rogers displays such as one shown here were common, and placed prominently to engage patrons entering the theatre. Always a downside for increased concession variety was attendant mess and necessary cleanup. Most of this stuff wound up on floors, and floors had to be cleaned, but how to monitor spillage and droppage through a typical day, where janitorial service ran a losing competition with kids using refuse for improvised missiles? You’d think no sensible exhibitor would encourage chewing gum sale on his premises, yet here is trade evidence that some did for sake of variety to customers. Enhancement of audience appetite was supplied by shows appealing to youth. 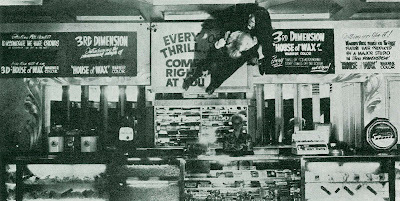 House Of Wax and others in 3-D were a natural for enhanced counter treatment, as here with the dimensional cutout looming over concession buyers. 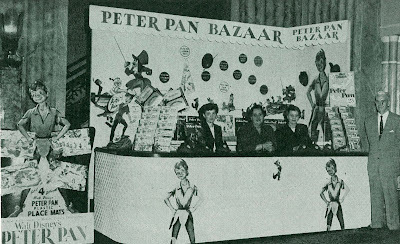 Restless youngsters sought out displays such as ones Disney provided for 1953’s Peter Pan, a marketplace for souvenirs well beyond mere candy bars and Pepsi. Note the availability of plastic place mat sets for four inspired by the character. There were also hats, phonograph records, comics, coloring books, the stuff of a well-named Peter Pan Bazaar, and early occasion for Disney to bring his merchandising right through the front entrance of houses where his animated feature was playing. Part of reason all this worked was prices kept within reason through the fifties and into the sixties. So-called (elevated) "theatre" rates for concessions were kept at bay at least that long, and business thrived, but how much customer good will has been forfeited since? I could sooner make down payment for a new car as pay for popcorn and a soft drink today. In fact, there was no concession stand. All movie palaces, were essentially theaters and there was no space for such commercial ventures. We used to have a gentleman with a tray, called "Chocolatinero", that would offer "Chocolate, Bombón, Helados". The Ice Cream was the best thing (and available only in movie theaters). It was a bar of cream covered in a layer of chocolate. The other big seller, was peanuts in chocolate, and there was candy (mostly "Sugus", from a company called Suchard, now Wrigley). Anyway, on ocassions we used to bring out our snacks from outside. It was always cheaper! From the looks of the women manning the stands I'm guessing that a stern warning went along with any Wrigley gum sales. I'd bet that, as concession employees got younger, those ladies went on to lengthy careers as high school lunch room monitors! Now that you mention it, Michael --- those ladies do look formidable, but none more so than Bulldog Frank that manned the Liberty's counter. I'd have gladly traded him for any of them! What, Radiotelefonia, no popcorn? Could it be because farmers didn't raise it in Argentina? They didn't here until it began catching on in theatres. "Back in the 1970s, when I was a motion picture exhibitor, our Concessions Supervisor used to tell us at meetings..."Doesn't it seem odd that we build million dollar theatre buildings to sell popcorn? The movies are just an excuse for people to sit down and eat it." I well remember going to the movies in the 1950s with my brother, when my folks would give us the princely sum of ONE DOLLAR -- for which Jack and I would get admission to the theater (25 cents apiece), popcorn (10 cents), a coke (10 cents) and a five-cent box of candy, Pom Poms for me and Junior Mints for Jack. Nowadays, all you can get for a dollar is four tokens for the video games in the lobby. Ah well! Since movie theaters were originally conceived as theaters in Buenos Aires, there were never concession stands. Popcorn was always something to eat in parks, when children are in the playground. Beyond films, in the old days there was a live performance. During the silent era and the early thirties some of the most prestigious artist like Gardel and Libertad Lamarque would perform their most popular songs immediately after the premiere of a major motion picture. For instance, Libertad Lamarque appeared, with great success in the stage after the very first exhibition of Laurel & Hardy's "Son Of The Desert". And Jorge Luis Borges was such a big stupid that he decided to leave the theater after the premiere of "Underworld" in 1927 in order to avoid to hear Gardel (really an idiot!). With the decadence of the traditional movie palaces, some of them return to their theatrical roots, others were sadly demolished like the Odeon, the place were the very first film exhibition took place in 1896. One of the theaters that did manage to survive is the Grand Splendid. Max Glücksmann's most important theater, built in 1919, was purchased by a bookstore that decided to preserve the structure. In this place, Carlos Gardel made most of his recordings and the very first radio shows with a live audience (from 1924) were broadcast. Fortunately, I managed to enjoy it as a movie theater.